MEET STARFIELD: An organic blend of friends and family, the members of Canadian band, STARFIELD, are united in a love for music and a desire to connect God with a postmodern generation. Their inventive musicality makes them popular with mainstream culture, while their uncompromising lyrics point the listener to deeper themes. Founded by brothers Tim and Jon Neufeld in Winnipeg, Canada, Starfield have won several GMA Covenant Awards in their home country, and their pop/worship albums have charted internationally. The hit single from their self-titled album, ‘Tumbling After’, featured on the TV show, Joan of Arcadia. Melodies are catchy and the lyrics are bible based. 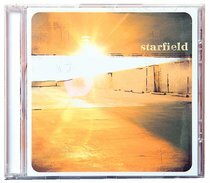 Starfield's first self titled album was released in May 2004. They originated in Canada recording demos in a friend's garage. Soon Sparrow records signed them and that opened them up to the American audience. I really enjoyed this album. The melodies are catchy and the lyrics are bible based. These men have a deep love of God and their desire is to make Him known. "Alive in this moment" talks about our quiet time with God and how  we don't prioritise time with Him. It talks about coming back to God in those quiet moments and spending time with Him and the beauty that comes from that.